If you're picking papaya directly from the tree, the key is to wait as long as you can, Love said, conscious of the fact that the riper the fruit gets, the more chance there will be of it being eaten by a bird, rat, or bat. Usually papaya are picked when they start to turn yellow, orange, or red, as a means of preventing this. If you're buying at the farmer's market or supermarket, "fruit should firm but mostly colored," he said. "Only green papaya may be good shredded for salads, but can be pretty strong to just eat raw. Buying fruit mostly colored, no matter where you are, is usually safe. How sweet it is depends on when it was picked." Once you've found a good, colorful papaya, how do you know its fully ripe and ready to be eaten? Ken is the Executive Director of Hawaii Tropical Fruit Growers and owner of Love Family Farms on Hawaii's Big Island. 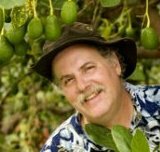 Besides being a vegan and a lover of fruit, he's lived in Hawaii for over 30 years, and is a proponent of sustainable and organic agricultural practices. "I tend to like papaya when it is picked ripe off the tree and then wait another day until the skin is soft and the soft meat can be easily take with a spoon," Love said. "Some restaurants serve harder papaya precut in the shell but I find the taste resinous. Its hard to beat a soft fresh papaya with its distinctive odor." Tastes differ regarding how ripe is best. Personally, I like them as sweet, juicy, and soft as possible. I want the outside skin to give easily to pressure. If the skin is starting to get really soft, all the better. This can take 2-3 days of ripening off the tree. Others will prefer slightly more firm flesh, and should not wait as long. Learning how to ripen papaya is part one of the bigger question: how do you select, buy, store, and ripen the many fruits you eat on a raw food diet. Learn more here. Read more about interesting fruit. Get on a healthy raw food diet and change your life.